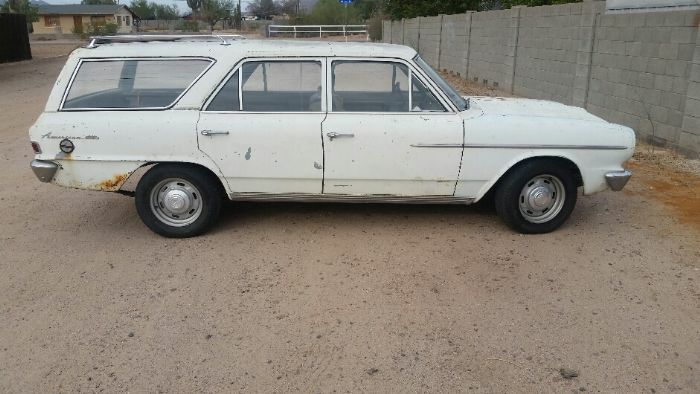 Up for sale is a '64 AMC (American Motors) Rambler American 330 station wagon. It has a 195.6 OHV six-cylinder engine, and a 3-speed manual column-shift Borg-Warner transmission w/ electric overdrive. The drivetrain is original to the car. When properly tuned and driven for economy, this drivetrain is capable of MPG in the mid-30's. It starts, runs, shifts, drives, and stops, and has a clean title in my name. It has an after-market AC unit that is complete, but needs charged. Originally a green car, it had a poor-quality repaint of white some time ago. Much work has been done to this car by the PO, and many spare parts are included. The brakes are new, the tank has been flushed and it has a new sending unit, the head has been re-torqued, the valves have been adjusted, and timing has been set. The tires are new, and it has a new battery. All lights work. The parts that are included with the car are a spare 195.6 OHV engine core (seized, but complete, including all the ancillaries), a 199 I-6 from a '69 Rambler, a presumably working transmission w/ the overdrive, factory rims and dog-dish hubcaps (Ford rally wheels and caps are on the car), all the trim and handles that are not on the car, and a couple of crates of miscellaneous parts. Also included is a factory service manual, and the manual for the B-W OD transmission. There are enough parts (many that are not pictured) to get this car rolling nicely as-is without having to chase them all down, if your plan is to just drive it. It's also a solid candidate for a restoration or a resto-mod, as it's complete. The only rust is a small amount in the bottom rear quarters. The floors and everything else is solid. It can be driven home if home is local, but it needs a clutch and a carb rebuild in order to be a daily driver. The engine is solid, and burns no oil. The seats are in rough shape, and it has no headliner. It has the airliner reclining front split-bench seat that fold into a bed. All in all, this is a solid car, and by virtue of being a Rambler, it's a bargain as far as vintage cars are concerned. I have only owned this car for a few weeks, and have decided to get into something different. $1900 firm. Text or email me for more info specific to this car, or to make an appointment to see the car. Calls will not be returned.